Gerry Scott, passed away on Monday, April 15th. He was 91 years old, a Veteran of both World War II and The Korean War and could not have been prouder of his military service to this country he cared so much about. He enlisted in the Army Air Corps at 17 and eventually rose to the rank of Capt. as the 6154th Air Police Squadron Commander in Seoul, Korea before he left the Air Force at age 25. He was a proud man - especially proud of his beautiful wife of over 68 years, Dolores. They met at a roller skating rink and only knew each other for six months before they married at St. Patrick's Church in San Diego. They had many great adventures together and weathered a few storms along the way, but very few people are lucky enough to have over 68 years with the person they love. They both enjoyed travelling and always talked about how they, as two young kids growing up in Wisconsin, never dared to dream they would do and see everything they were able to in their lifetimes, both here in the U.S.A. and abroad. Gerry and Dolores had three children, Kathy (married to Dale Lelli), Dale Scott, and Scott Scott, as well as five grandchildren, Kristen, Alyssa, Renee, Bryan, Jason and three great-grandchildren, Jaelynn, Kaden and Rylan. He was a friend to many, enjoyed telling and hearing jokes, participated in many sports in his younger days - handball, karate, golf, water skiing (even ski jumping off of a ramp! ), and off-road motorcycle riding. In his later years he would take five-mile walks to the park and back. He was a lifetime member of the American Legion, the Air Force Security Forces Association, and other military groups. He was even written about in the book "Skycops And Peacekeepers". He held many jobs during his life including being elected twice to the office of Secretary-Treasurer of Teamsters Union Local 952. He very much cared about representing and being one of the membership he served. The one job he did the most and the one he never tired of was truck driving. He had over three million safe driving miles under his belt when he retired in his 80's and had mastered driving with triple trailers! He owned his own trucking company when he lived in Wisconsin but sold it to move to California - away from those cold winters. Gerry liked the warm weather! He truly loved being on the open road, listening to country music along the way. His military funeral will be on May 1st at Riverside National Cemetery at 1PM. Donations in the name of Gerry Scott would be welcome at "The Highground Veterans Memorial Park" in Neillsville, WI, where Gerry has a Korean War Tribute Stone. It was his favorite charity and he visited many times. TO PLACE YOUR ORDER CALL ALMA AT 714-740-6228. Skimpy health plans touted by Trump bring back familiar woes for consumers - Los Angeles Times? THE CALIFORNIA ranch-house lifestyle, founded on sunshine and ample backyard space, worked when the state’s population was 12 million in the 1950s and 22 million in the ’70s. But now its population is 40 million. You don’t need to be a Nobel physicist to figure the direction California must go to solve its acute housing shortage — up. Stop expanding sideways, and become more like New York City — and less like us. Those words are painful to write for a native Californian who grew up on a small orange ranch in Ojai and worships wide-open spaces. But it’s inevitable. The California ranchhouse lifestyle — founded on sunshine and ample backyard space for a pool — has become increasingly unaffordable for middle-class families in urban areas where most jobs exist. Living space has tightened and become impossibly pricey for too many. It was wonderful when our population was only 12 million in the 1950s and 22 million in the 1970s. But now we’re at 40 million and headed to 50 million by 2050. For many, the economics of supply and demand are making the California Dream a nightmare. Fortunately, state legislators are awake and trying to fix it. So is Gov. Gavin Newsom. They’ve been pushing housing development away from traditional ranch-home suburbia and toward densely populated, multi-story living near transportation centers. And they’re planning a lot more of that this year. The massive Centennial project near the Tejon Pass in wildfire country is a conspicuous outlier. It was approved by L.A. County supervisors in December. California prides itself on being the nation’s leader in many things, but we’re far behind the curve on creating housing easily accessible to commuter rail. The Washington, D.C., regional Metro system with its nearby apartment complexes and townhouses puts California to shame. “We set up our land-use patterns for a much smaller state,” says state Senate Housing Committee Chairman Scott Wiener (D-San Francisco). “Jobs are in major urban areas and housing has been built further and further out, forcing a lot of sprawl. “We have people com- muting by car up to two and a half hours each way and that’s not the California Dream. Freeways have become almost impossible to use. We need more sustainable land-use patterns.” Wiener adds: “We should put the right state standards in place so we don’t continue to gobble up farmland and open space, which is part of the California DNA. And we’re also forcing people to live in wildfire zones. “We have a 3.5-million housing deficit and people can’t afford to live here anymore.” Over the decades, the ranch-style home has expanded, devouring open space and pushing up prices. “The average size ranchstyle home has grown tremendously,” says Senate Transportation Committee Chairman Jim Beall (D-San Jose), a former San Jose city councilman and Santa Clara County supervisor. “The home I grew up in [during the 1950s] was 1,300 square feet. There were eight kids. When we got to 10, we moved into a house with 1,800 square feet. Now these home-builder guys are going out in suburban areas and building 2,500and 3,000-square-foot homes.” Families have gotten smaller but the houses have ballooned. Why? “You know why,” Beall replies. “Houses got bigger because they’re making more money off them. You can make more money building one big house than you can two smaller ones. And quite frankly, they’ve priced themselves out of the market for most people in California.” Unaffordable homes and unbearable commutes are the two main factors driving housing away from suburban sprawl and toward urban transportation centers. Another motivation for Democrats is to meet their ambitious climate change goal of significantly reducing greenhouse gas emissions from tailpipes. There are several housing bills now entering the legislative process. Some make cities and counties jittery at the prospect of losing control to the state. “We need to work collaboratively with the state as a partner,” says Carolyn Coleman, executive director of the League of California Cities. “We’ll get further working together than we will by some other means.” “Other means” includes Newsom suing Huntington Beach over allegedly violating state housing laws, and threatening to withhold gas tax money from cities he deems aren’t doing enough to spur home building. One of the most controversial current bills is Wiener’s SB 50. It would attempt to boost home building near transit. Developers could build up to five-story apartment and condo complexes around rail stations. Minimum parking space requirements would be waived. Wiener praises L.A. and Oakland as role models for what he’s attempting. Sen. Nancy Skinner (D-Berkeley) has a bill that would declare a statewide housing emergency and require local governments to expedite their permitting of home building. “The bill says, ‘Local government, do what you’re doing, but do it faster,’ ” she says. “Fast-track it.” Cut the red tape. That’s what Republicans have long advocated. Skinner’s a dedicated liberal. Beall and Assembly housing committee chairman David Chiu (D-San Francisco) have similar bills to create new, cleaner versions of redevelopment agencies that were killed in 2011 by Gov. Jerry Brown and the Legislature. They thought the agencies were unhinged money-wasters and a bit corrupt. But the agencies spent $1 billion annually to build affordable housing. The new entities would have a tighter state leash. Another Chiu bill would incentivize building of highdensity, affordable rentals for low-income people near transit stations. It’s a proposal to keep people working and off the street. The California ranchhouse lifestyle was great in the last century. But for the poor and middle class, it’s an endangered species that needs to adapt. A rising star of the labor movement, she’s made a career of getting unruly people to do what she wants. SACRAMENTO – California Attorney General Xavier Becerra and the California Labor Commissioner’s Office today announced the filing of a petition with the U.S. Court of Appeals for the Ninth Circuit, challenging the Federal Motor Carrier Safety Administration’s (FMCSA) efforts to undermine the state’s meal and rest break rules. The FMCSA’s action comes in response to a petition by the American Trucking Association (ATA), incorrectly claiming that California labor protections for truck drivers are preempted by federal law. This action builds on Attorney General Becerra’s efforts to protect the rights of workers across California. In 2018, Attorney General Becerra wrote the FMCSA opposing the ATA’s attack on California’s meal and rest breaks. In January, the California Department of Justice joined a multistate comment letter opposing a National Labor Relations Board proposal that would diminish protections for millions of workers. Last year, Attorney General Becerra filed an amicus brief supporting the rights of truck drivers to receive reimbursement for certain expenses incurred in relation to their employment. Attorney General Becerra also co-led a coalition of 17 attorneys general opposing a Trump Administration rule to allow employers to pocket the tips of certain employees, resulting in the loss of up to $5.8 billion of workers’ earned tips. In November 2017, Attorney General Becerra filed a lawsuit against One Source, a janitorial subcontracting company based in Orange County, to protect janitorial workers in retail establishments all over California from wage theft. A copy of the petition filed with the court can be found here. H&R Block is training its employees to be more empathetic this tax season, when some Americans will see their refunds unexpectedly reduced.CreditCreditChristie Hemm Klok for The New York Times. The governor-elect also tapped Jason Elliott, a policy advisor to Newsom during his time as mayor of San Francisco and a chief of staff to San Francisco Mayor Ed Lee, as another chief deputy cabinet secretary overseeing executive branch operations. Elliott and Wei will serve under Ana Matosantos, Newsom’s previously announced cabinet secretary. Fighting a $Multi-Billion Corporation Together ... & Winning! UFCW's bargaining team held the line. 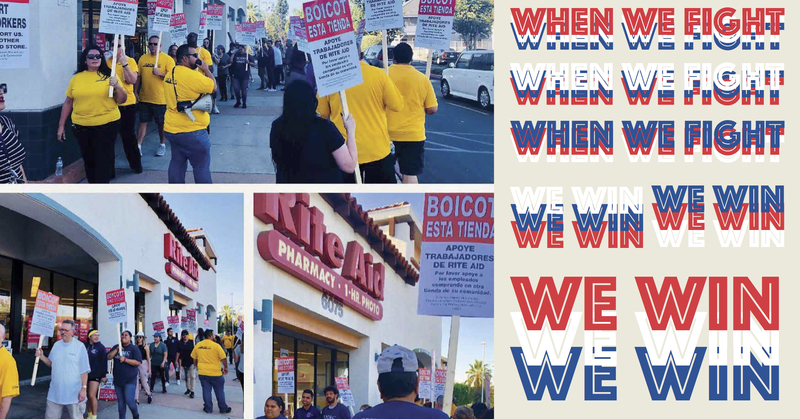 And when the workers called, you boycotted Rite Aid stores in a demonstration of solidarity and principle. With your support, workers fought. And workers won a Tentative Agreement for a strong three-year contract with Rite Aid that they will now vote to ratify on October 1st! This fight wasn't only about 357 Rite Aid stores across Southern California. It wasn't only about the 5,900 men and women who chose to form a strong union with UFCW, and who chose to fight for fair wages, continuous healthcare coverage for workers and retirees, fair scheduling that employees and their families count on. The fight wasn't only about UFCW 770 members and the union they worked to build with their Rite Aid sisters and brothers in Locals 135, 324, 770, 1167, 1428, 1442. This fight, like all of our fights, is about winning and protecting quality of life and workplace power for workers everywhere. Ninth Circuit Upholds Prevailing Wage for Ready Mix!!! “This company steals wages from drivers and warehouse workers every day, and they use every trick in the corporate playbook - many illegal, all unethical - to divide workers and slash employee costs: misclassifying drivers as independent contractors, staffing warehouses with permanent temporary employees, paying workers less than the required minimum wage, and forcing employees to toil off the clock. They think they can get away with it because most of us are immigrants, but those days are over - we’re fighting back and taking the fight to NFI’s customers, including Lowes, Amazon, Puma, and others. 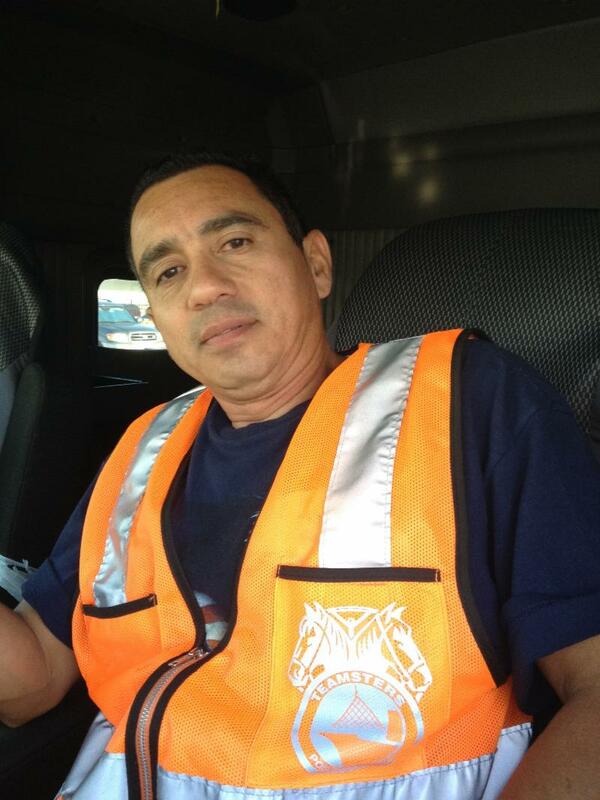 NFI/Cal Cartage warehouse workers and port truck drivers are united and we won’t stop until we get justice,” said Juan Lara, a port truck driver fighting for his employee rights at NFI’s California Cartage Express division. Mendieta’s art, sometimes violent, often unapologetically feminist and usually raw, left an indelible mark before her life was cut short. Democratic U.S. senators led by Elizabeth Warren of Massachusetts urged a Trump administration labor board appointee to recuse himself from a case that could end up being a big victory for corporations trying to make it harder for workers to unionize. The case before the National Labor Relations Board deals with the right of companies to restrict workers’ online organizing efforts. 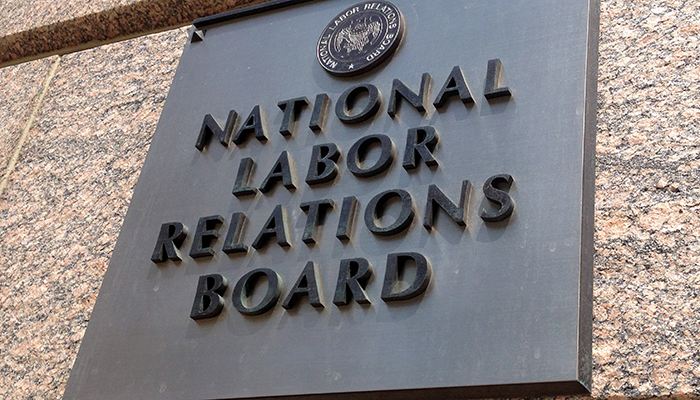 In a letter sent to NLRB Chairman John Ring, a Trump appointee, Senators Kirsten Gillibrand of New York, Cory Booker of New Jersey, Mazie Hirono of Hawaii, and Tammy Baldwin of Wisconsin joined Warren in demanding the recusal of NLRB member William Emanuel. The NLRB invited input last month on whether it should use the case, Caesars Entertainment Corp., to reverse an Obama-era precedent in which employees at a company called Purple Communications won the right to use work email to organize. Emanuel had previously worked as an employment law attorney at Littler Mendelson PC. While the management-side law firm isn’t directly involved in the Caesars case, it does represent Purple, which appealed its 2014 defeat to a federal court, where it’s pending. “Thus, member Emanuel’s participation, in any form, in Caesars Entertainment Corp. would present a clear conflict of interest and put him in the position of using the power of his office to influence the interests of his former employer—exactly the scenario that federal ethics regulations are designed to avoid,” the senators wrote in their Monday letter to Ring. An NLRB spokesperson said Ring would respond to the letters, and declined further comment. Management-side advocates have argued that Democrats are applying a double standard on ethics issues in an effort to derail the agency’s ability to pursue pro-business precedents. The letter “is a continuation of the long-game to attempt to prevent the board from having an operating Republican majority,” said Roger King, a management-side attorney for the HR Policy Association. The Democratic senators contend the email case echoes an earlier controversy, one in which Emanuel joined the majority in a 3-2 party line vote to reverse another Obama-era precedent, the so-called joint employer rule. In that case, the Republican majority voted to make it harder for companies to be held legally responsible for alleged mistreatment of workers ostensibly employed by their contractors or franchisees. After the NLRB’s inspector general concluded that Emanuel shouldn’t have participated because Littler Mendelson represented a party in the Obama-era case that established the rule, the other members of the NLRB voted to throw the new decision out. That left the Obama-era rule in place. The NLRB is now moving to undo that precedent through its regulatory process, issuing a proposed rule last week. Democrats have also urged NLRB member recusals from a pending decision in the “Fight for $15” movement’s conflict with McDonald’s Corp. They argued that Emanuel and Ring shouldn’t participate because their former law firms were brought in by the fast-food company to advise franchisees on how to respond to the union-backed campaign. The "Labor Question" Is Back, Big Time. That term came into use around the turn of the 20th century; it was a shorthand way of asking: What should be done about the abysmal conditions in which American workers were compelled to labor, and about the smoldering discontent those conditions engendered? The anger was palpable, made manifest in waves of worker revolts that stretched from the nationwide rail strike of 1877 through the general strikes of 1919. The overwhelming public support for striking teachers this spring in such red states as West Virginia, Oklahoma, and Arizona was no fluke; another recent poll, this one from the venerable education pollster PDK, found 73 percent support for teachers’ strikes, and a remarkable 78 percent support from parents of school-age children. The 2-to-1 rejection of a right-to-work law this summer by Missouri voters is further evidence of a pro-labor shift in public opinion, as are the successful unionization campaigns over the past year of such not-easily-fired workers as university teaching assistants and journalists (including those at such venerable anti-union bastions as the Chicago Tribune and the Los Angeles Times). If you are not receiving this newsletter straight to your inbox, please click here. An overwhelming non-union electorate voted in favor of unions. What does that portend? Nominees will be chosen in Missouri’s US Senate race and a key House race. Voters will also decide a statewide ballot initiative. It’s the first time voters have overturned right-to-work laws through a ballot referendum in recent years. Shavelson ignited a huge strike by women garment workers that helped galvanize the labor movement. She went on to fight for suffrage and tenants’ rights. Mr. Kitman is the New York bureau chief for Automobile magazine. A gas tax, which went into effect in November, was intended to finance road improvements, including part of Interstate 10 in Los Angeles. commercial driver’s license — they would hire him for a $50,000 job. over the United States for a year. country faces uncontrolled inflation, which can easily lead to a recession. Trucking remains one of the most dangerous professions in the country. driver is nearly eight times as deadly as being a law enforcement officer. feasible after he had children. and pull into truck stops that typically serve greasy hot dogs and chili. People with CDLs suddenly seem as coveted as computer programmers. Vehicle Training Association — to fight for new graduates. sites that would have them home most nights. so badly that it is lowering the bar for new hires. by, including many Somali refugees who’ve been trained there. college and now work desk jobs. How Good Is the Trump Economy, Really? It depends on whether you look at the level, the direction or the rate of change — three concepts that are often conflated. The largest union representing federal workers took the Trump administration to court Thursday to block a new executive order that severely restricts the time employees may spend on union activity, claiming the president’s action violates the First Amendment and oversteps his constitutional authority. The lawsuit filed in U.S. District Court for the District by the American Federation of Government Employees ratchets up ­labor-management tensions that have simmered at federal agencies since President Trump took office. “This president seems to think he is above the law, and we are not going to stand by while he tries to shred workers’ rights,” J. David Cox Sr., national president of the AFGE, said in a statement announcing the lawsuit. The White House referred questions about the case to the Justice Department, which declined to comment. Under official time, federal employees who also serve as union officials are permitted to work on-duty time to represent employees who have filed grievances claiming unfair labor practices by management or who are appealing disciplinary action against them. These officials, who spend anywhere between half and all of their time working on union matters, also negotiate collective bargaining agreements. Their responsibilities are limited to representing employees in the workplace and do not include internal union business, such as collecting dues, soliciting membership or elections. The other executive orders Trump signed instruct agencies to crack down on unions in contract negotiations — with the goal of less union-friendly agreements — and to move more aggressively to fire employees with records of misconduct or poor performance. Administration officials say these changes, which build on successful efforts in several states to weaken public employee unions, will make government smaller and more efficient by weeding out bad apples and rewarding employees who play by the rules. But the most controversial change has turned out to be to the official time guarantee that Congress gave federal employee unions four decades ago. That guarantee allowed union representatives to use some of their work time to negotiate for workers on everything except pay, which is determined by Congress through the General Schedule. Conservatives in Congress have tried unsuccessfully for years to restrict official time. The administration, which says the work of public employee unions should not be heavily subsidized by taxpayers, estimates that reducing the practice to 25 percent will save taxpayers as much as $100 million a year. AFGE, which represents about 700,000 federal workers, argues in its lawsuit that the Trump administration has violated the union’s right to freedom of association, guaranteed by the First Amendment. The lawsuit claims the administration has singled out labor organizations for disparate treatment. The union is using language from the executive order to make its point: The order prohibits union employees from using official time to represent other federal workers in grievance or disciplinary proceedings, but it provides an exception for employees working on their own cases. “There is no valid basis to distinguish grievances brought by the union [on behalf of the] union or grievances in which a union representative seeks to represent another employee from grievances brought on an employee’s own behalf or instances in which an employee is to appear as a witness in a grievance proceeding,” the lawsuit says. AFGE also says that mandating the number of hours agencies may authorize for employees’ use of official time to 25 percent illegally changes a provision of the law Congress passed in 1978 — the Civil Service Reform Act — that governs collective bargaining and determines that official time is lawful. “Congress passed these laws to guarantee workers a collective voice in resolving workplace issues and improving the services they deliver to the public every day — whether it’s caring for veterans, ensuring our air and water are safe, preventing illegal weapons and drugs from crossing our borders, or helping communities recover from hurricanes and other disasters,” Cox said. Leaders of the National ­Treasury Employees Union, the ­second-largest federal labor organization, with about 150,000 members, said they are still studying what the executive orders mean for existing collective bargaining contracts , weighing legal action and communicating with their members. “Our basic message [to our members] is that the administration has made it very clear they think federal workers are dispensable, that they don’t respect and value front-line employees,” said Tony Reardon, the NTEU’s national president. out rent-regulated tenants and catapulting apartments into the free market. Los Angeles, CA – Today, the Los Angeles City Council, which oversees the largest container port in North America, unanimously vetoed the Foreign Trade Zone Operating Agreement (FTZ) granted by the Port’s Harbor Commission to California Cartage’s warehousing and port trucking operations located on Port property in Wilmington, CA. The FTZ designation provides a clear competitive advantage to NFI/Cal Cartage, the largest trucking and warehousing operation at the port, by providing tax breaks to its retail clients. The Los Angeles Harbor Commission approved the FTZ for Cal Cartage, which was purchased by NFI Industries in October 2017, despite the ongoing pattern of violations of health and safety, employment, and labor laws at the company (see list of legal and regulatory action below). For the past three years, NFI/Cal Cartage warehouse workers and port drivers have persistently demanded that the LA Harbor Commissioners address the enduring law-breaking at the company’s warehousing and trucking facilities, which are located at 2401 East Pacific Coast Highway, which is owned by the Port of Los Angeles. This site includes the NFI/Cal Cartage warehouse and two related trucking companies, K&R Transportation and California Cartage Express. On April 5, 2018, the LA Harbor Commission approved a one-year Foreign Trade Zone (FTZ) Operating Agreement with the company. On April 17, 2018, the LA City Council approved a motion filed by Los Angeles City Councilmember Joe Buscaino to assert jurisdiction over the matter, and on May 1, 2018, the Trade, Travel, and Tourism Committee recommended that Council veto the Harbor Commission’s approval of the FTZ agreement. Today, the full City Council voted to veto NFI/Cal Cartage’s FTZ Operating Agreement. California Cartage, based in Wilmington, CA, is one of the largest goods movement companies in America, with warehouses and port trucking operations across the U.S. Referred to herein as “NFI/Cal Cartage,” this family of companies was recently acquired by the New Jersey-based National Freight Industries (NFI). Previous to this acquisition, Cal Cartage was owned and managed by Robert Curry, Sr. and his family. NFI/Cal Cartage represents the largest trucking operation at the Ports of Los Angeles and Long Beach by a wide margin. Over the past two years, there have been at least 12 decisions issued by the California Labor Commissioner in individual claims filed by NFI/Cal Cartage drivers working for K&R Transportation, Cal Cartage Express, ContainerFreight, and CMI. All of these claims found that the drivers were, in fact, employees, and not independent contractors. Together, those decisions ordered NFI/Cal Cartage to pay those 12 drivers a total of $1,419,102.62 for Labor Code violations including unlawful deductions and unreimbursed expenses. NFI/Cal Cartage has appealed twelve of these cases, settling eight of them, while one remains pending in Superior Court. There have been an additional 28 Labor Commissioner claims that drivers have filed against NFI/Cal Cartage, all of which appear to be pending (of these, 15 were filed by K&R drivers and 12 by CMI drivers). 10 of the K&R drivers had their hearings in December 2017, and a decision is pending. There are hearings scheduled beginning May 7, 2018 in the claims of 10 CMI drivers. The total liability for those 28 claims is over $5 million. In recent years, NFI/Cal Cartage has faced four class action lawsuits in California Superior Court for multiple Labor Code violations, including willful misclassification, unlawful deductions, unreimbursed expenses, unpaid minimum wages, and failure to provide meal and rest breaks, along with violation of California’s Unfair Competition Law. In December 2017, the last pending case settled for $3.5 million and a motion for final approval is scheduled for May 2018. The company recently settled three similar suits. Cal Cartage Container Freight Station in Wilmington, CA, is a warehouse and freight center on Port of LA property and employs approximately 500 workers, with 80 percent of the workforce being employed through a temp agency. While Cal Cartage warehouse workers once had good paying jobs that provided benefits, they have not had representation from a union in over 30 years and conditions have suffered. Workers are now paid the state minimum wage with little or no benefits (even though they are entitled to a higher wage under the Los Angeles Living Wage Ordinance), and work in health and safety conditions that are deplorable. The company has been cited for serious health and safety violations twice in the past three years, and workers face serious retaliation resulting in unfair labor practices charges and five strikes. Cal/OSHA reinvestigated the facility a year later, resulting in additional serious citations in November 2016 amounting $67,150 for the warehouse and $51,275 for the staffing agency. Citations included not providing workers with steel-toed boots, not properly attaching shipping containers to the dock, and repeat violations for unsafe brakes on forklifts. The investigation regarding the company’s abatement of these citations is still active. Workers filed a third Cal/OSHA complaint in November 2017, and the investigation is still pending. On February 28, 2018, Administrative Law Judge (ALJ) Ariel Sotolongo issued a decision finding that California Cartage and its subsidiary Orient Tally violated workers’ rights at the 2401 E. Pacific Coast Highway, warehouse, including by engaging in unlawful interrogation, implied threats of termination, and confronting workers in a physically aggressive fashion. This decision ordered the company to cease and desist the unlawful behavior, and was issued following a hearing held in June 2017. The case arose after Region 21 of the National Labor Relations Board issued a March 2016 Consolidated Complaint (Cases: 21-CA-160242 and 21-CA-162991) against California Cartage for unfair labor practice (ULP) charges. In 2016, workers at the same warehouse filed additional ULP charges with the International Brotherhood of Teamsters against California Cartage for several unfair labor practices including then company owner Bob Curry threatening to close the warehouse if workers unionized. These charges are pending. Jackie Nespral sits down with the candidate for Congress - who again is going for the seat occupied by Debbie Wasserman Schultz, but this time not as a Democrat. A federal agency that regulates labor unions is engaged in something close to civil war as political appointees, career bureaucrats and its inspector general battle one another. The agency is the National Labor Relations Board, created in 1935 to promote collective bargaining and adjudicate disputes between businesses and workers. An independent agency insulated — in theory — from partisan politics, the NLRB under President Donald Trump is consumed to the point of paralysis by fights over personnel policies, ethics rules and legal decisions that stem from ancient political disagreements over the proper balance of power between employers and workers. The in-fighting is bad news for workers who seek the NLRB’s help to organize unions and increase corporate accountability for labor law violations — and also, paradoxically, bad news for employers who want to fight unionization and limit corporate liability by reversing pro-labor rulings issued under the Obama NLRB. At the center of the controversy, which has pitted civil servants against political appointees, conservatives against liberals and, on occasion, conservatives against other conservatives, are Peter Robb, the NLRB’s bare-knuckled general counsel, and board member William Emanuel, a controversial Trump appointee with deep ties to business. Robb outraged the NLRB’s career staff in January by proposing a restructuring that would demote regional directors, whom the business lobby considers too pro-union. That prompted revolt from the NLRB’s employee unions. “Peter Robb is considering measures to ‘streamline’ the NLRB that will only make it harder to remedy federal labor law violations,” read a flyer that three New York union locals distributed at an event Robb attended in February. The second and more elaborate NLRB controversy concerns Emanuel's decision not to recuse himself in December from Hy-Brand Industrial Contractors, a pro-business ruling in which the NLRB’s inspector general later concluded Emanuel had a conflict of interest. After the inspector general issued his report, the NLRB vacated the ruling. Meanwhile, the NLRB’s inspector general, David Berry, is investigating a second NLRB member, Mark Pearce, who is one of the board’s two Democrats. (By law, two of the NLRB’s five board members are chosen by whichever party does not occupy the White House.) Berry is following on a complaint filed by the Competitive Enterprise Institute, a conservative nonprofit, based on a Wall Street Journal editorial that accused Pearce of alerting in advance attendees at an American Bar Association meeting in Puerto Rico that Hy-Brand would be vacated. Pearce did not answer a request for comment. Berry, in turn, stands accused by the National Right To Work Legal Defense Foundation, the legal arm of the anti-union National Right To Work Committee, of disclosing confidential board deliberations improperly in his report on Emanuel, and in a follow-up report issued one month later. The right-to-work group asked an umbrella group, the Council of the Inspectors General on Integrity and Efficiency, to investigate. Berry did not answer a request for comment. “It’s sort of like 'Game of Thrones,'” said Roger King, a friend of Emanuel’s and senior labor and employment counsel for the HR Policy Association. Or maybe three-dimensional chess. The National Right to Work Committee is a natural ally to Emanuel, but, remarkably, it’s come to regard Emanuel as a problem that must not be replicated in future NLRB nominations, lest pro-labor Democrats gain an upper hand through additional recusals. In its March newsletter, the group revealed that the Trump administration ignored its advice “not to choose … another management attorney who would have to recuse himself or herself potentially from vast numbers of cases involving clients of the attorney’s former employer.” That advice, the newsletter complained, “went unheeded” when Trump nominated Ring, a partner at the management-side law firm Morgan, Lewis and Bockius, “whose client list is even longer than Littler Mendelson’s.” The Senate confirmed Ring last week. In effect, Leen was saying that the Trump administration was so blatantly anti-labor that it may be unable to fulfill its anti-labor objectives. It’s hardly new for politicians to wrangle over the NLRB. In 2012, the board made headlines when President Barack Obama tested the limits of his executive power by bypassing Congress and granting three recess appointments to the NLRB even though the Senate was technically in session. Obama ended up losing in the Supreme Court. This time, though, partisan warfare has penetrated the agency itself. General counsel Robb sent senior agency staffers reeling after he announced in a Jan. 11 conference call that he wanted to consolidate the agency’s 26 field offices into larger “districts” overseen by officials hand-picked by him. Under Robb’s plan, regional directors would lose their classification as members of the Senior Executive Service — the civil service’s highest rank — and be replaced by a new layer of officials who'd be answerable to Robb. The title “general counsel” makes Robb sound like a lawyer for NLRB management, but in fact it’s arguably the agency’s most powerful position. The NLRB general counsel is the agency’s gatekeeper, a sort of prosecutor who brings cases before the board. The vast majority of NLRB cases are processed at the NLRB’s 26 field offices and never reach the board. The field offices are staffed by career officials who don’t typically agree with the pro-management outlook of Robb, to whom they report. In a letter to Robb shortly after the January conference call, the regional directors called his proposed changes “very major” and complained that they hadn’t “heard an explanation of the benefits to be gained.” They also warned that enacting such changes might prompt senior directors and managers to retire en masse — a clear shot across the bow. In reply, another official from the general counsel’s office proposed by email additional restrictions on the decision-making power of regional officials, such as requiring all cases go through headquarters for initial review. Robb declined to comment for this story and, according to a source familiar with his thinking, is upset that the controversy spilled into public view. Marshall Babson, a former Democrat appointee to the NLRB, said that Robb’s proposed changes risk making the NLRB less efficient. “If you’re talking about injecting another level of review, that could slow things down,” he said. Shifting rationales for the changes have intensified the career staff’s suspicions about Robb’s motives. At the March ABA meeting in Puerto Rico, Robb’s deputy John Kyle said they were intended to bring the agency in line with the White House’s proposed 9 percent budget cut for the agency. But the $1.3 trillion spending bill signed into law last month by President Donald Trump, H.R. 1625 (115), rejected that cut and maintained funding at current levels. The budget picture grew more complex Tuesday when the White House budget office alerted NLRB that the agency should spend only $264 million of the $274 million it received in the spending bill, a 3.6 percent reduction. Such a rescission, were it to become permanent, would require congressional approval under the 1974 Congressional Budget and Impoundment Control Act. 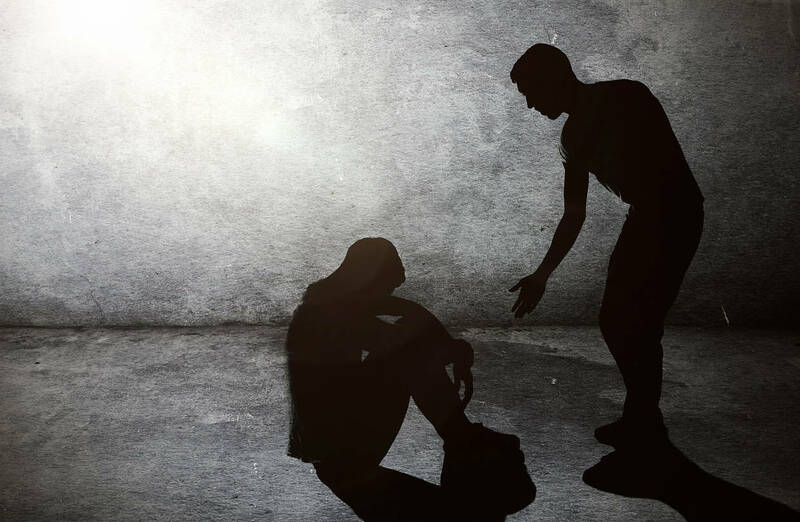 “I am unaware of a single instance in the past wherein the White House or OMB subjected the NLRB to the budget rescission process,” said Marshall Babson, a former board member. Fevered though the Robb Revolt is, it hasn’t yet engulfed members of the board itself. The same can’t be said about the controversy surrounding Emanuel and his participation in the December Hy-Brand decision. Hy-Brand narrowed the circumstances under which a business could be classified a so-called joint employer, jointly liable for labor violations committed by its contractors or franchisees. It reversed an earlier ruling in Browning-Ferris Industries, a 2016 decision by the Obama NLRB that broadened the circumstances under which a business could be classified a joint employer. Fast-food chains like McDonald’s were outraged by Browning-Ferris because it put them on the hook for maltreatment of employees over whom they didn’t necessarily maintain direct control. Hy-Brand was rushed out along with several other pro-management decisions shortly before a Republican NLRB member’s term was about to end in December, leaving the board deadlocked, 2-2. The overturning of Browning-Ferris took many by surprise, because Hy-Brand wasn’t a case that had much to do with the joint-employer issue. “It was a rush to judgment,” said Wilma Liebman, a Democratic board member under Presidents Bill Clinton, George W. Bush and Obama. One week after the Hy-Brand ruling, congressional Democrats accused the NLRB of loading the dice by allowing Emanuel to participate. Emanuel’s former law firm, Littler Mendelson, had represented a party in Browning-Ferris, noted a Dec. 21 letter to Emanuel from Senate HELP Committee ranking member Patty Murray (D-Wash.), House Education and the Workforce Committee ranking member Bobby Scott (D-Va.) and others. In the letter, the six Democrats posed several questions to Emanuel about his participation in Hy-Brand. In his response, first reported by ProPublica, Emanuel said he wasn’t aware at the time of the ruling that his firm had been involved in Browning-Ferris, noting Littler’s very long client list. Unfortunately for Emanuel, he’d already noted his firm’s participation in Browning-Ferris on a questionnaire submitted during his confirmation hearing. Emanuel scrambled to revise his response, but the damage was done, and inspector general Berry opened an investigation. The first report, issued Feb. 9, was scathing, finding “a serious and flagrant problem and/or deficiency in the board's administration of its deliberative process.” Emanuel, Berry concluded, should have recused himself from the decision to overturn the Obama-era standard. The NLRB’s other three board members, including Trump-nominated chairman Marvin Kaplan, were persuaded by Berry’s reasoning and vacated Hy-Brand, waiting to act until after Emanuel departed for the ABA conference in Puerto Rico. Emanuel was stunned when a fellow attendee pulled up the ruling on a cellphone, according to a source who was present at the conference. Emanuel, who declined to comment for this story, hired Zuckerman Spaeder, a prominent white-collar law firm that previously represented former International Monetary Fund Managing Director Dominique Strauss-Kahn. Bostwick also wrote that one month after the Hy-Brand decision, the NLRB’s designated ethics official told Emanuel that she didn’t believe Emanuel should have been required to recuse himself in that case. According to the letter, Emanuel asked for that opinion in writing, but the request was denied at the OIG’s request. Emanuel’s allies have cried foul, noting that former Democratic NLRB member Craig Becker participated in cases involving local chapters of the Service Employees International Union despite having previously been counsel to SEIU. In that instance, Berry raised no red flags. Becker declined to comment on the record. Berry acquitted Emanuel of the most serious charge: lying to Congress about whether he was aware of a possible conflict of interest. But that did little to cool Congress' fury. After Berry issued the report, Sen. Elizabeth Warren (D-Mass.) and Rep. Keith Ellison (D-Minn.) called on Emanuel to resign, saying he “no longer has the credibility” to serve. CORRECTION: Due to an editing error, an earlier version of this story misstated a proposed reduction to the NLRB budget. Also, an earlier version of this story misstated the new NLRB Chairman’s first name and the name of the HR Policy Association. WASHINGTON, D.C. — At the second meeting of the Joint Select Committee on Solvency of Multiemployer PensionsPlans today, U.S. Senator Rob Portman (R-OH) made the case that the panel must work together on solutions that address the multiemployer pension crisis and deliver results, saying that, “the status quo is not acceptable.”Portman is hopeful that his colleagues on both sides of the aisle can come together to achieve a comprehensive and permanent solution that protects earned pensions, protects taxpayer dollars, prevents the insolvency of the Pension Benefit Guaranty Corporation, and alleviates pressure on employers. The focus of the hearing was on the legal structure and history of the multiemployer pension system, and Portman focused his questions on funding rules for plan sponsors and employer withdrawal liability, which are important issues in ensuring that plans can improve their solvency without placing an undue burden on contributing employers. The Joint Select Committee on Solvency of Multiemployer Pension Plans consists of 16 members of Congress: four Republicans and four Democrats in the both the House and Senate. The deadline for the Committee to vote on a statement of findings and recommendations, and propose legislation to carry out these recommendations, is November 30th.In order to successfully report out legislation, a minimum of five out of the eight members of both parties must support it. Transcript of the questioning can be found below and a video can be foundhere. Something is happening in America. A growing number of working people are recognizing that the best way to raise our own standing is by standing with the person next to us. Collective action is on the rise. Building power for working people was the focus of our district meetings held from coast to coast over the past several weeks. Secretary-Treasurer Liz Shuler, Executive Vice President Tefere Gebre and I were inspired by the energy and enthusiasm local unions brought to each of these gatherings. We focused on the political landscape, the need to increase our density and the ways we can use the 2018 election to engage with our members on issues. We highlighted the Workers’ Bill of Rights and our Path to Power program, which is helping elect more union members to office. We talked about the threats of Janus and right to work and our power to overcome them. And we made some important asks like assigning local union coordinators, identifying elected officials who are union members and incorporating Common Sense Economics into your outreach. We are bringing our vision of a robust, diverse and politically independent labor movement to life. Since our final district meeting April 10, more than 10,000 new members have joined our movement. Flight attendants at JetBlue (TWU), utility workers at Atlanta Gas Light (IBEW), registered nurses at Stanford Valley (CNA/NNU), health care workers at UMass Medical (AFSCME), personal support workers and registered nurses at Spectrum Health (IAM), editorial staff at the New Republic (TNG-CWA) and teaching and research assistants at Harvard University (UAW), just to name a few. This comes on top of the historic teacher strikes sweeping the country and a special election in Pennsylvania where labor catapulted Conor Lamb to Congress. Clearly, momentum is on our side. I couldn’t be prouder of the work we’re doing together. But even in good times, we can’t afford to let up. Let’s keep building power for working people by raising our voices and growing our movement. Congresswoman Maxine Waters of the 43rd District of California, a.k.a. Auntie Maxine, has made my generation proud to be nieces and nephews. She is adored and admired by people who care about social justice and is oh so eloquent in letting the world, particularly the white men of Congress who dare test her acumen, know that she is not here for any nonsense. From “reclaiming my time” to leading a movement to “impeach him,” she says what many of us are thinking. And she reminds us that we are worthy of any space we occupy. She’s not new to it, she’s true to it.